Quetta, Pakistan — A joint radio project by UN Women and United Nations Volunteers is empowering both the volunteers who create the programmes and the marginalized communities that tune in. The "Community-focused Radio Project" engages women and youths in Quetta's Hazara and Khaizi communities in producing and broadcasting entertainment, informational and educational programmes for their communities. 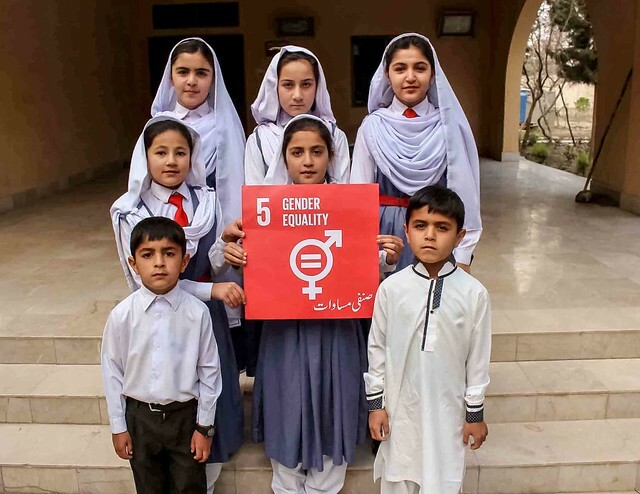 The volunteers shared their inspirational stories as UN Women and United Nations Volunteers celebrated International Women's Day on 8 March by highlighting the "Power of Radio and the Spirit of Volunteerism" in Quetta, the capital city of the southwestern province of Balochistan. "Through the Community- Focused Radio, I got a chance to express myself beyond the bounds of my home," Nighat Michael said. "I felt like a valuable member of society who could play an equally important role in development of the community. Today, I feel driven to stand up for women's rights as I have realized the importance of having a voice." Said another volunteer, Fatima Gul: "Men and women together can work to improve the living conditions of communities. We need to realize how important women are for building a society. We have produced four radio programmes to highlight the importance of women's rights and their empowerment. And I believe this is just the beginning, to change the conservative perceptions held against women in our society." Radio is an effective way to reach people in Balochistan because many cannot read, have limited access to newspapers, and cannot afford other media. Under the UN Women/United Nations Volunteers project from 2016 to 2018, Balochistan's Media Department and Radio Pakistan trained 30 volunteers in radio skills including presentation, programme production and broadcasting. Radio Pakistan Quetta airs the programmes. The project also set up groups of listeners in both communities to give suggestions on community issues and feedback on the programmes. Sohail Khattak, Station Director of Radio Pakistan, highlighted at the 8 March ceremony the importance of women in the media, particularly radio. He encouraged women to join such fields where they can to make their voices heard. "I believe every day should be women's day as women, in every capacity--be it as a mother, daughter, sister or wife--are outperforming their counterparts," he said. "I am blessed to have a daughter as my first child. She always wanted to be a lecturer and today she is. All women should come forward and join different professions as teachers, police officers, radio disc jockeys, doctors and so on." The 8 March event was attended by members of civil society, local government, academia and the community, rural and urban activists, and youth groups. It focused on community volunteers, especially women, and the difference that they make. Women in the audience told inspirational stories. Schoolchildren sang a special song. A performance by a local theatre group highlighted women's rights to education, inheritance, and choice of profession. Invited speakers talked about the importance of easing the way for women in the home, at home and in public areas. Said Rasheeda Panezai, Head of Mahec Trust, a community development organization: "We need to offer women-friendly facilities and infrastructures in institutions, courts, secretariat, and public spaces so that women can feel comfortable accessing such facilities. Moreover, men should not just give respect to women who are in their homes, but they should also respect women in markets, public spaces or workplaces." Yasmin Lehri, Member of Provincial Assembly in Balochistan, said: "It's undeniable that women face difficulties in proving themselves or getting their due acknowledgement. It starts from our homes - we need to admire and acknowledge our daughters more than our sons because they struggle every day to break the barriers laid in their ways. I urge educated women to join government institutions so that they have a say in decision-making, which can then have a trickle-down effect on women, both in urban and in rural areas, who are unable to claim their rights."